Carol and Steve Hickmott run two small Gallery / Gift Shops at 34 Victoria Road, Loch and 10 A’Beckett Street, Inverloch. We offer a friendly local service with everyone welcome to browse, and are also agents for Traralgon Dry Cleaners. Specialising in the small unique gift range, we pride ourselves on our value and good customer service. We stock items such as Tilley Soaps, Stationary, Linen Products, Shopper Bags, Tea Towels, Specialised Pens, Bone China items, Glasses Cases, Bookmarks, Cards etc, at very reasonable prices. We also display a wide variety of original art works by Carol Hickmott, Carole Warner and Judith Healey. 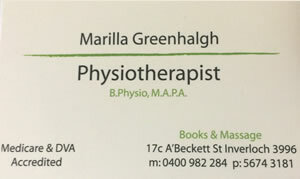 Marilla has 20 years experience as a physiotherapist and utilises a gentle, hands on approach combined with exercises prescription to effectively treat muscloskeletal injuries, aches and pains. Marilla is Medicare and DVA accredited. Appointments are available at Books and Massage in A’Beckett Street, Inverloch – please call 0400 982 284. The Beach Box is a cosy cafe with a sunny outlook, freshly cooked and prepared breakfast and lunch, something for everybody and great coffee! 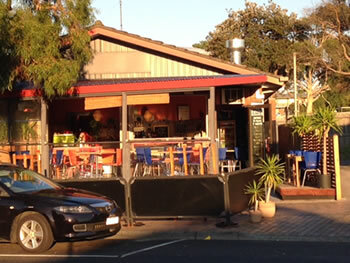 Located right opposite the park at 6 Ramsay Boulevard, Inverloch.